The feathered chain stitch is a decorative hand embroidery stitch that utilizes detached chain stitches arranged in a zigzag pattern as if working the feather stitch, forming a hybridized stitch. It actually looks like a long-tailed daisy done in a zigzag manner. Being a motif stitch, it can be used for light borders and with other embellishments. This highly textured surface embroidery stitch makes a fairly wide path of stitching, making it perfect for use in bands and rows of embroidery. It looks beautiful framing an embroidered band on a towel or when used around the sides of a tablecloth, spacing it about 5 inches from the edges. If you are an embroidery beginner, you should be able to work the chain stitch before doing this variety. Pre-mark parallel lines as stitch guides using a water-soluble fabric marking pen. You may be able to work with only an upper and lower line, though you can add two lines near the center as well. The lines will be removed after the embroidery has been completed. Bring the needle up through the fabric on one of the marked lines (point 1). Insert the needle back in the same hole (point 1) and bring the needle up through the fabric at a short diagonal away (point 2). The needle should go down and come back up without pulling the thread through yet. Make sure that the working thread is under the needle, and then pull the needle through the fabric. This will form a teardrop shape. Go back down through the fabric a short diagonal away (point 3). You have formed a single, detached chain stitch with an elongated anchor stitch, which should take up about two-thirds of the vertical space in the marked area. Next, bring the needle up through the fabric on the other marked line (point 4). Though not necessary, as you finish the first stitch, you may want to go down at point 3 and come back up at point 4 all in one motion. Go down at point 4 and come back up at point 5, which should be very close to point 3 on the previous stitch. Finish the stitch by going down at point 6. Repeat these steps across the entire row to work a band of stitches. 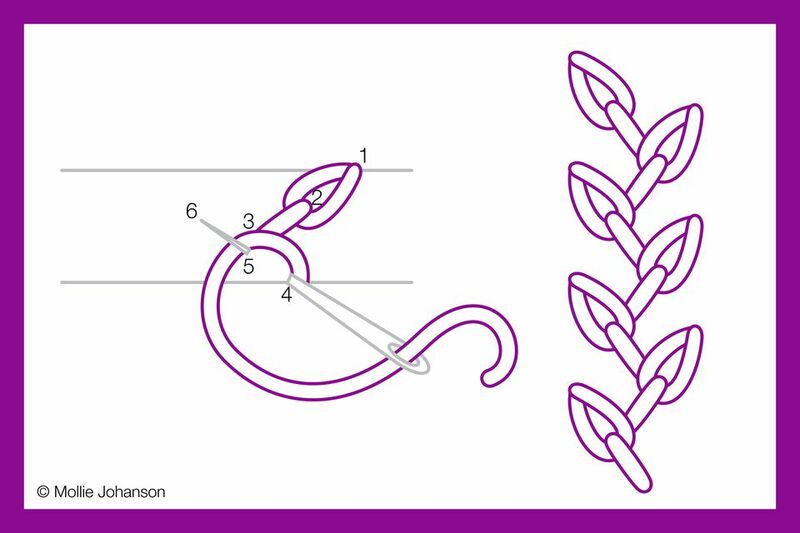 Working this stitch on a straight line or on evenweave fabric is the easiest, but you can also work the feathered chain stitch on a gentle curve. Adjust the spacing so the chains on the inside of the curve are a little closer together. You can work this stitch in multiple colors. Thread several needles, each with a different color of thread, then work each stitch, changing the colors as you go. For some variety, try altering the length of each stitch. You might also combine this with other stitches, such as french knot "berries" or even a simple straight stitch to fill in the teardrop shapes.